Opt for the latest Pester palletizing generation to automate your pharmaceutical production. The smart two-station palletizer from our new Compact series, provides the maximum palletizing height on a small footprint. This modern, intelligent robot technology ensures freedom for multiple tasks, boosts efficiency, and increases the process safety. The single-station palletizer handles low-performance tasks within a compact space. 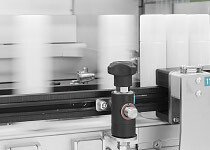 State-of-the-art robot technology used a thousand times all over the world, ensures the highest availability and low life-cycle costs throughout the machine runtime. Efficient two-station palletizer for simple integration into any line. Intelligent technology and ergonomics offering high operating safety and optimum operating comfort. Benefit from highest machine availability thanks to the two pallet stations that ensure a pallet change without line downtime. Trust in our four-station palletizer with supreme operating comfort. The pallet magazine with integrated transfer system for fully automatic pallet handling ensures unattended production.